VIA shows off the VB7009, a new embedded Mini-ITX motherboard that measures only 170mm x 170mm. It's aimed at POS and kiosk applications. VIA Technologies, Inc, a leading innovator of power efficient x86 processor platforms, today announced the VIA VB7009 embedded Mini-ITX board. Measuring only 17cm x 17cm, the VIA VB7009 Mini-ITX is an extremely flexible embedded board with top class functionality and performance for POS and kiosks. The VIA VB7009 is a cost effective solution offering a broad range of power efficient VIA CPU choices, including the dual core VIA NanoTM X2 processor, providing superior flexibility to match customers’ embedded computing needs. Paired with the VIA VX900 unified all-in-one media system processor, the VIA VB7009 Mini-ITX embedded board delivers a highly optimized platform that boasts stunning HD video performance of the most demanding video formats at resolutions of up to 1080p. "The range of customer needs for interactive embedded devices is rapidly expanding," said Epan Wu Head of the VIA Embedded Platform Division, VIA Technologies, Inc. "The VIA VB7009 provides a flexible and cost effective solution that can be configured to satisfy a broad range of customer requirements." 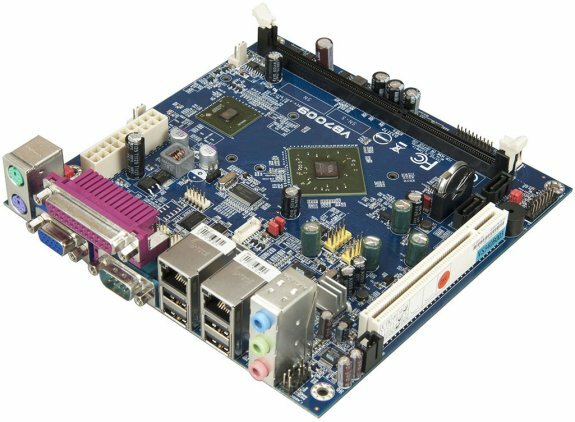 The VIA VB7009 Mini-ITX embedded board offers a wide variety of CPU choices ranging from a fanless 1.0GHz VIA C7 to more powerful options of either a 1.6GHz VIA C7-D or 1.2GHz dual core VIA Nano X2 processor. In addition to enabling support for up to 4GB of DDR3 system memory, the VIA VX900 MSP features the VIA ChromotionHD 2.0 video processor, boasting comprehensive hardware acceleration for the latest VC1, H.264, MPEG-2 and WMV9 HD formats at screen resolutions of up to 1080p without incurring a heavy CPU load. Rear I/O includes one VGA port, four USB 2.0 ports, one COM port, two Gigabit Ethernet ports, one PS/2 keyboard/mouse port and three audio jacks for line-in/out and mic-in. Onboard pin headers provide support for an additional four USB 2.0 ports, three COM pin headers, an LPC connector, SMBus connector, PS/2 support, audio jacks, and LVDS. The VIA VB7009 is fully compatible with Microsoft and the most popular Linux operating systems and is available in a variety of configurations.